The theme will be Mental Health: Integrate, Innovate, Individualise. 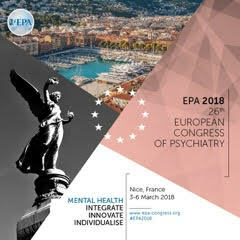 A special focus of EPA 2018 will be the integration of new technologies and research finding into person-centred approaches to prevention, care and training, at a time in which difficult challenges, such as displacement, war, terrorism and economic constraints, require new answers. More information on abstract submission, click here.